Patton Electronics has rolled out the new CopperLink™ CL2300E Featuring a ruggedized enclosure and a conformal coated PCB assembly, the unit provides stable operation in temperatures ranging from -40o to +85o Celsius—with protection against humidity, condensation and corrosion. Bandwidth Rich—Bond up to 4 twisted pairs to achieve the desired rate and reach. 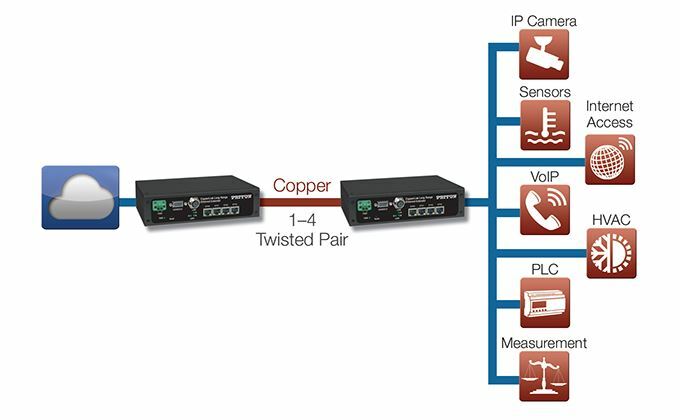 Operates Over Twisted Pair—Realize fiber-optic speeds without the expense—and hassle—of installing new cables or line-of-sight wireless circuits. Transparent LAN Bridging—Bypass network configuration requirements by transparently passing all higher layer protocols—including 802.1Q VLAN frames (tagged and untagged). Ideal for extending Long Range Ethernet LRE segments in machine-to-machine MTM and industrial networks, theCL2300E uses wire-bonding technology with up to four twisted pairs to extend a single Ethernet connection with superior speed and distance performance. The CL2300E eliminates the expense and delay of installing new cabling when interconnecting industrial WiFi Access Points WAPs , IP Cameras, programmable line controllers PLCs, flow meters, magnetic sensors, and similar IP-enabled devices with SCADA systems or remote industrial-Ethernet LANs. Extending Ethernet up to 2 miles (3.2 kilometers) over any installed copper network infrastructure (UTP, STP, CAT5e, telephone cable, etc. ), each twisted pair provides bandwidth ranging from 5.7 Mbps to 15.3 Mbps depending on segment length. In noisy environments or situations where copper cable quality is questionable, the CL2300E is also an excellent solution for point-to-point Ethernet connectivity, capable of delivering bandwidth greater than 60 Mbps. CopperLink auto-rate adaptation negotiates the best-possible speed and distance for each wire pair. Should one wire-pair fail, the CL2300E automatically adjusts the overall line rate for a stable connection. Six user-selectable line-rate modes and all pair-bonding settings are configurable, so industrial network engineers can control the speed/distance combination when required.